W3 Shopping Cart is a robust, easy to use eCommerce shopping cart for your existing website. Add W3 Shopping Cart to your website quickly and easily. Sell an unlimited number of products and digital goods, or take secure payments for services on any website, anywhere! Multiple currencies are supported including US Dollar (USD), UK Pound Sterling (GBP), Euro (EUR) and many more. 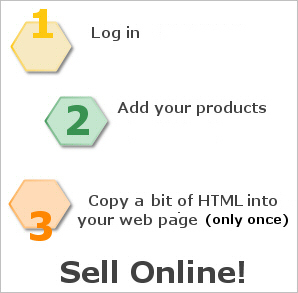 » You're selling online today! W3 Shopping Cart works with any of these popular Internet Merchant Gateways for taking payments online. Sign up for one of these merchant gateways. Note: W3 Shopping Cart also works without an Internet Merchant Gateway...find out more. "I must say that the super cool shopping cart has worked wonders for instilling confidence and trust in the customer. Maybe too much as our sales have increased 3 fold so far over last years sales- and the year is only half over. When will I find time to go fishing?" Jason...Nimble's Thimble Display Case Co.